The Chief Minister of Tamil Nadu Government today announced a four percent of Dearness Allowance to its employees and pensioners with effect from January 2017. 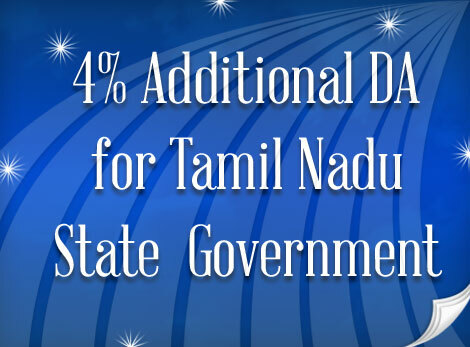 Today the Chief Minister of Tamil Nadu has declared an another installment of additional 4% Dearness allowance with effect from Jan 2017 to the employees working under Tamil Nadu Government. Following the announcement, the existing percentage 132% is increased to 136% from Jan 2017. Following the Central Government, the state government has declared DA to its employees from the existing rate of 132% to 136% with effect from 1.7.2016 as per existing basic pay.